Description: This is a program that looks like it should be on Dutton Epoch! Patterson’s bright and high-spirited piece was written four years ago for the soloist here and wraps two colorfully virtuosic fast movements around a Barcarolle with a haunting, wistful melody. The other two concertos were premiered in 1953 by Frederick Grinke (whose Stradivarius Howick now plays), the Leighton predominantly dark, edgy and full of nervous energy with a sardonic scherzo and a lento finale which ends in resignation while the Jacob is characteristically brisk and bracing in its neo-classical outer movements which enclose a poetic and beautiful romantically inclined slow movement. Dutton Epoch repertoire but at mid-price! 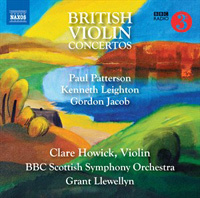 Clare Howick (violin), BBC Scottish Symphony Orchestra; Grant Llewellyn.